Never before offered for sale, Frank Gehry models represent several American and European projects for the architect. Included will be skyscrapers of the Brooklyn Arena Project, 2004 and the recently completed Beekman Tower, 2010, in New York City. Models from other projects such as the Andorra Museum, 2008, the Sonderborg Kunsthalle, 2010, the Moscow Hotel, 2007, the Lombardy Competition, 2003, the Museum Study, 2009 and the Barcelona Triangle, 2008, will also be presented. Constructed from a wide variety of materials including paper, basswood, vinyl and lead these extremely rare models provide a working insight into the continuous evolution of Gehry's creative mind. 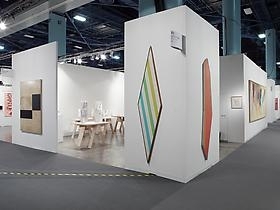 Click here to read the Miami Herald's coverage of LFFA's booth.